What attributes make the perfect chocolate chip cookie? Is it chewy or cakey? Loaded with chocolate or sparse? What about the important question: Do you eat them with a glass of milk? 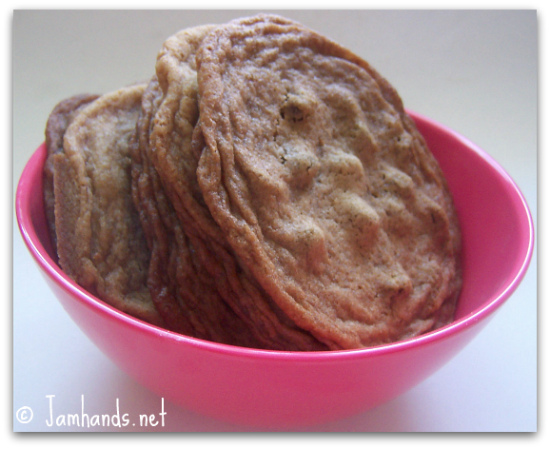 When it comes to the flat and chewy chocolate chip cookies, these might be my favorite. They are buttery, chewy, a little salty and utterly delicious. I'm still on the hunt for my favorite cakey chocolate chip cookie. If you have a recipe to recommend be sure to leave a comment. Be sure to check out these other food blogs that have tried the recipe: The Wednesday Chef, Laura Rebecca's Kitchen, and My Madeline. 1. Preheat the oven to 325-degrees F. Line two baking sheets with parchment paper or Silpat. Sift together the flour, baking soda and salt. 3. Roll 2 1/2 -tablespoon lumps of dough into balls, then place on the baking sheet and flatten to 1/2 -inch-thick disks spaced 2 inches apart. Chill the dough between batches. Thanks for telling me about this recipe. It really does look incredible and I like the idea that it's a little salty. When I'm not so cookie-d out, I'm going to have to give this one a try for sure. Just made this recipe (at 9 in the morning...don't judge). They seem more like candy than cookies. Delicious! have to leave a comment, i've tried a bazillion choc. chip cookies recips. i've tried modifying recipes time after time. then i stumbled on this one, and i've never ever looked for another. THANK YOU. The amount called for was a typo - it is now fixed so it should be less sugary. This is the best recipe for non-cakies! Thank you.